Food mixers come in a range of styles and sizes that will suit any kitchen. You don’t have to be a professional chef or baker to own one as they are a great tool to have around, even when making simple dishes. Food mixers can chop, blend and mix all kinds of food, saving you time and effort in the kitchen when you need it the most. 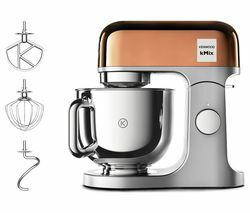 There are several different types including stand mixers and hand mixers with top brands such as Kenwood food mixers and Bosch food mixers leading the way. If you’re looking to spend less time in the kitchen or even if you want to branch out and create more adventurous dishes you’ll find a food mixer that fits your requirements. 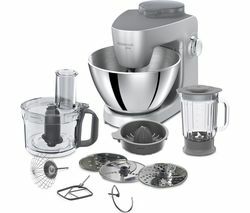 The Kenwood kMix KMX50GYW is a professional looking food mixer that will compliment your kitchen. It combines performance, durability and functionality. It has 8 separate speed settings, a capacity of 5 litres and has dishwasher safe parts so you’ll have no trouble cleaning it after use. If you’re looking for a way to take some of the effort out of baking bread or cakes then a food mixer could be the ideal appliance for your kitchen.